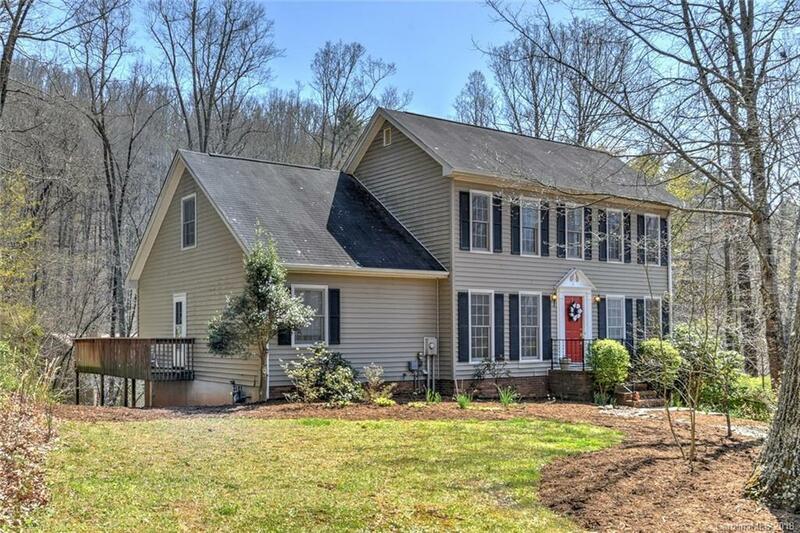 Beautiful Well Maintained Home Nestled In A Private Woodsy Location, Yet Only 10 Minutes To Vibrant Downtown Asheville & Super Convenient to Weaverville. Situated In A Quiet Small Neighborhood With No Thru Traffic, This Spacious Home Features Gorgeous Hardwood Floors Throughout The Main living Area, Cozy Gas Log Fireplace & A Soaring Ceiling In The Living Room, Updated Eat-In-Kitchen w/Abundant Cabinet Space, Large Dining Room, Updated Bathroom Flooring & Fresh Interior Paint. Large Master Bedroom On Main, Upstairs Balcony Overlooking The Living Room, Two Additional Bedrooms & 1 Bath On 2nd Level As Well As a Bonus Room. 2 Car Garage In The Basement & Workshop Space, But That's Not All, Enjoy Entertaining Guest On The Large Back Deck or Relaxing While Absorbing The Private Serenity. Catch This One Before It's Gone!!! HOME WARRANTY OFFERED!